Reminder from me to me …. The last few days have been extremely rough for me. I came across this post and once again, a message from me to me. Recently, that is all I have been hearing from friends, family and significant others alike. To be patient. To wait out the storm. To have faith. 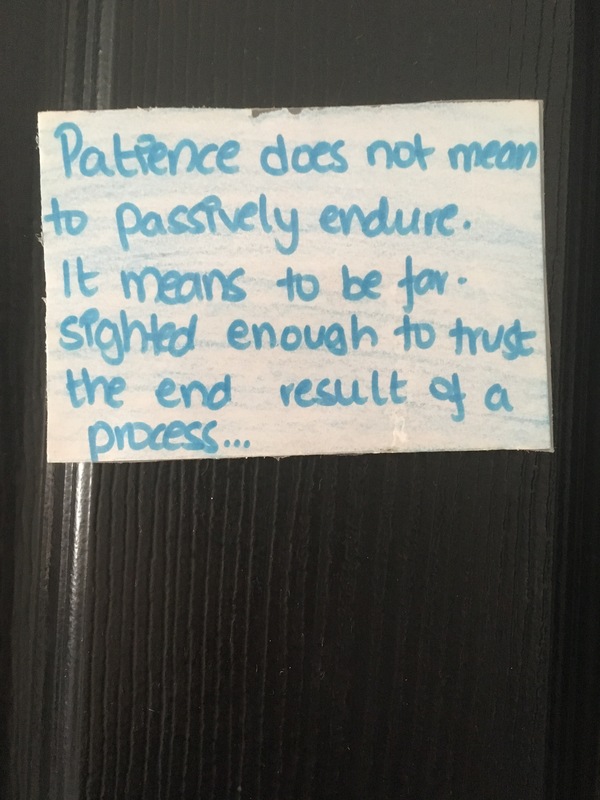 What exactly does patience mean? Does it mean to be meekly accepting of all and any situation that is to arise in our lives? Or does it mean to stay quiet through your hard times ? Topassively endure ? “Patience does not mean to passively endure. It means to be farsighted enough to trust the end result of the process” – rule #8 from The Forty Rules of Love by Elif Shafak. I’ve gathered that patience is not to sit on your hands or twiddle your thumbs while waiting for things to happen. Patience is not keeping quiet when it is better to speak.